Flowering and leaf-bearing stems smooth, ascending or erect, 3 to 7 inches high from slender, prostrate, perennial stems and rootstocks which are often several inches in length. Leaves few, clustered at the summit of the stems, ovate or oblong, 1 to 1 ½ inches long, two-thirds to 1 inch wide, pointed at each end, rough-margined. Flowers one to five on a stem, axillary to the upper leaves, rose-purple or rarely white, two-thirds to 1 inch long on slender, short flower stalks; wings of the flower obovate; crest of the corolla beautifully fringed. 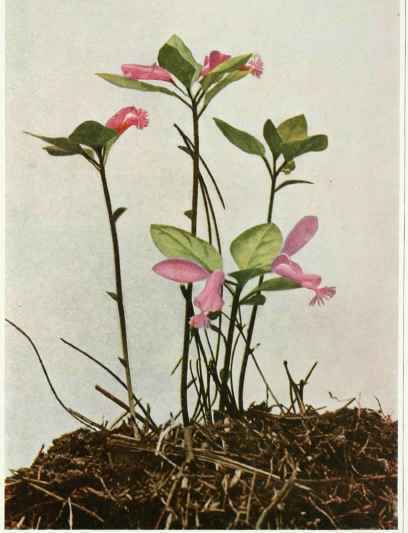 The base of the stems and root-stocks bear numerous cleistogamous flowers on short, lateral, subterranean branches. In rich, moist woods, New Brunswick to Saskatchewan south to Georgia, Illinois and Minnesota. Flowering in May and June.